Negotiable! Hot tub, new master bath. Special pricing for January! NOTE: We will be replacing the beds in the 2nd bedroom on January 5, 2019 and changing to a queen size bed. We do also offer an air mattress. This newly remodeled 2-story townhome has been decorated to make you feel relaxed and able to fully enjoy your Rocky Mountain experience. There are tennis courts, a one-car garage and a deck and balcony off the master bedroom with spectacular views of the mountains. The master bedroom has a king size bed with a deep, extremely comfortable mattress. The 2nd bedroom has one twin bed and a full/twin bunk bed, therefore sleeps 4 until January 22nd, when we will be changing to one queen bed. If you have more than 4, there is an air mattress available. This beautiful, conveniently located unit is 2 blocks from Main Street in downtown historic Frisco. Frisco is an 1880’s mining town surrounded by the majestic Rocky Mountains and on Lake Dillon. Frisco is in the center of Summit County’s downhill ski areas: Breckenridge, Copper Mountain, Keystone & Arapahoe Basin are only a short drive to Vail & Beaver Creek. It’s an easy drive from Denver to Frisco and whether you drive or take other transportation, you’ll never need a car once you arrive. The unit is located within easy walking distance to restaurants, coffee shops, stores, and only a couple blocks from the Summit Stage that offers free shuttle service to the Summit Ski areas and the Silverthorn Factory Outlet stores. Contact: Tracy or Lara at the phone number or e-mail listed below - keys and additional information (maps, transportation choices etc.) forwarded after reservation confirmed. Walking distance to Main St. Frisco. Password will be provided upon arrival. Stocked with all of the supplies you'll need! We enjoyed our stay at Tracy’s place, but getting into the property was a little more difficult than we’d anticipated. There was so much ice in the driveway and walkway leading into the house that it was a hazard. We couldn’t get the car into the garage due to the ice mound. The garage wouldnt close and a draft of cold air was coming through garage into the house. Tracy was able to get someone to the house by 11:00a the following day, but the ice was so bad in this particular spot that they couldn’t remove it. They carved steps into the ice since it was a slope from the driveway to the walkway, and our car bottomed out on the ice speed bump going in and out of the garage once they chizzled it down. The property was about 50-55 degrees when we entered. It just didn’t seem like it was being maintained on the outside and it wasn’t warm when we arrived. It’s a mountain rental, its Important to maintain the walkways, IMO. I’m also a bit bias as we used to live in Frisco and this sort of upkeep just comes with living in the mountains. I couldn’t get Tracy on the phone right away and one of the documents had a wrong number listed for her backup. We finally found another document with a good number, and her backup was able to get us connected to Tracy as they were at the same party. I was a bit frustrated by the time we reached someone because we were having trouble with the keypad (no fault of Tracy) and due to the obstacle course getting in, but Tracy was able to talk us through the entry and said she would try to get someone over the next day to clear the walkway, and she did. It was just too far gone to really make a difference, I think. After all the rigamarole, it turned out to be a pretty comfortable stay. It’s comfortable and well equipped for cooking. The hot tub was great and beds were really comfy. I'm sorry you had to endure the ice. We've had an unusual amount of snow this year (which we're very happy about), and did not have anyone else complain. We did address is as soon as absolutely possible in less than 24 hours. In addition, I did provide a very clear document which gave instructions on how to use the keypad on the door. I'm not sure why you unable to access them, as we have not had that problem in the past. I hope we were able to resolve any challenges you had to your satisfaction. Great experience and loved Frisco and Copper. We really enjoyed our stay in Frisco. The condo was very nice and had everything we needed. 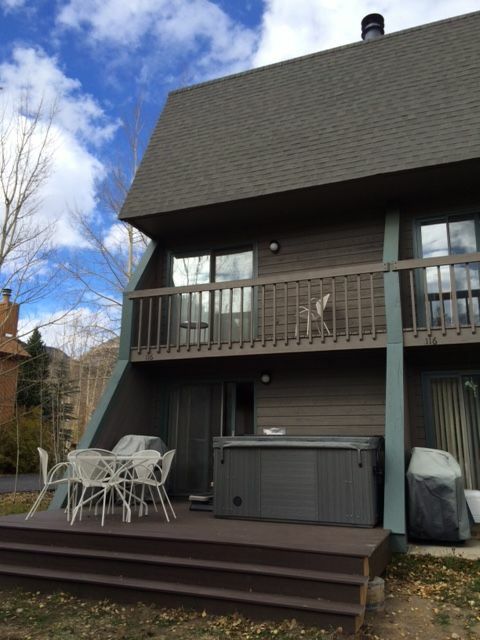 We loved the location, it was walking distance to Main Street and a short drive to Copper. The hot tub was great after skiing. So glad you enjoyed our condo. Please come back soon! Good spot for 2 couples. Comfortable beds. Kitchen and Baths were well stocked. Quiet neighborhood with town being easily accessible. Had to split your own wood for fireplace. Thank you for the nice review. Please come back soon. House was in a great location in Frisco Colorado. Easy access to town/ restaraunts. House was very clean. Garage was a nice option to have on a snowy morning. Inside there was a wood fireplace and outside there was a hot tub. House was very comfortable and very close to several ski mountains. Copper mountain was about 10 min, Vail 20 min, Breckenridge about 15 min. Owner was great! I’d definitely stay there again. Thank you for the nice review and your understanding during your stay! Comfy townhome, very close to downtown Frisco. Well stocked. Hot tub was perfect! Thank you for you nice review!